There’s a lot to like about the email below received last week from Radian6, makers of social media monitoring tools (and recently acquired by Salesforce.com.) Most notable: not once in the entire copy is the company or product mentioned. This is content marketing, pure and simple. 1. The headline: “Strategically Social: 5 Keys to Becoming a Social Business” promises a specific, tangible learning benefit (“5 Keys”), drawing the reader into the copy. 2. The very first paragraph identifies the offer immediately, in terms that promise insight and information of value. 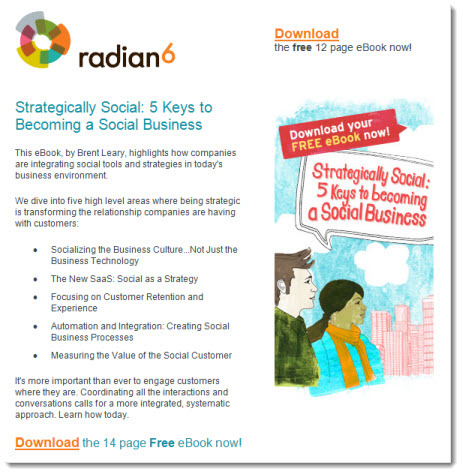 Note that whereas there’s no mention of the product, the people most interested in what the ebook has to offer (“…how companies are integrating social tools and strategies …”) are by default those that will be interested in Radian6 solutions. 3. On the one hand, I appreciate the list of bulleted topics in that it gives substance and detail to the offer and what the reader will learn if he/she responds. Some of the topics, however, are vague, lack tangible benefits, and aren’t particularly compelling. Prime example: “Automation and Integration: Creating Social Business Processes.” Wha …? In sum, the Radian6 email demonstrates a simple truth of content-based demand generation: you don’t need to sing the praises of your product to be effective. If your offer appeals to the very same people facing the challenges and problems your product can solve, you’ll generate good leads regardless. This entry was posted in B2B Marketing, Content marketing, Copywriting, Creative, Demand Generation, E-mail, email design, email marketing, Social Media and tagged B2B Marketing, Content marketing, Copywriting, Demand Generation, email design, email marketing, graphic design, radian6, salesforce.com on October 20, 2011 by Howard Sewell. Thanks so much for taking some time to share your feedback with us. It’s so important to us to hear what the people in our community have to say and every tip, comment, question and suggestion is valued. We appreciate your candor and have passed on your suggestions.